Three months after the PDC conference and I’m finally catching up on the reading materials I collected in LA. 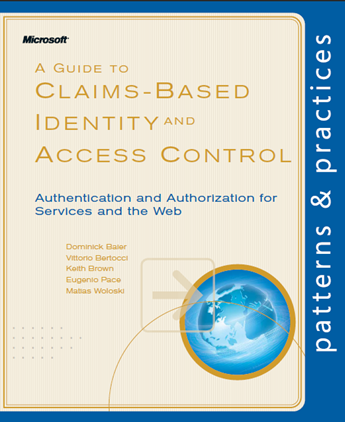 One of the books I picked up was a copy of the Patterns and Practices Group’s A Guide to Claims Based Identity and Access Control. It turns out that this book just RTM’ed and is now available online in PDF and HTML formats. This book is unique in the Microsoft world. You can find all kinds of books that scratch the surface of application and web service security. If you’re looking to dive deep and understand Claims-based identify and federated security, you were relegated to piecing bits of information from blogs, MSDN, and other sources – until this book arrived. The books takes a topic that is complex and difficult to comprehend and approaches it from the perspective of several personas: a security specialist, software architect, developer, and operations manager. While this is by no means an O’Reilly Heads-First style book, the persona approach, professional illustrations, simple metaphors, and meaningful examples go a long way towards making the material much more digestible. After a basic introduction to claims and claims-based architectures, the book dives into 4 detailed examples. For each of these topics, the book provides a case study complete with diagrams, code snippets, and commentary from the technical personas. Complete source code is available on line as well for those who want to dive deep into the details. I’m about three quarters of the way through the book now and have found the book to provide an excellent learning experience. It was humbling to find out how little I knew about how to establish claims based identity. On the other hand, as I look at some upcoming client work that is asking for claims based identity and the use of ADFS, I’m really glad that I’ve had the chance to work through this book and familiarize myself with the lay of the land prior to diving into the deep end. Outlook plays an important role in my day-to-day work. It’s the one omnipresent desktop application – the first thing I open when I start Windows and sticking around as long as Windows is running. Over the years, I’ve adopted, tailored, and shared several techniques for inbox, to-do list, and archive file management. Even with these techniques, I’m always looking for ways that Outlook can meet me half way and make the task of managing the daily email avalanche a little bit easier. I was hoping that the upcoming release of Outlook 2010 would provide some features that would really wow me. 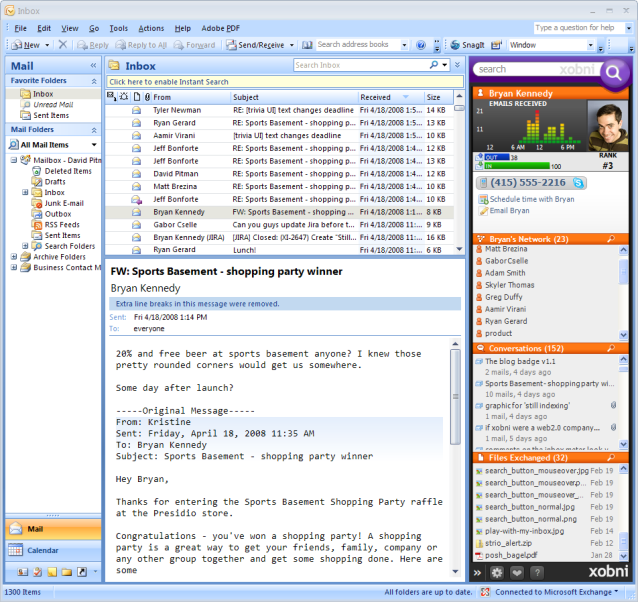 I’ve been working with the beta version of Outlook 2010 on several of my machines and, although there are some nice features such as threaded email conversations and some basic social networking integration, I have yet to say “Wow”. Since Outlook 2010 wasn’t fulfilling all of my needs, I decided to look into Outlook plug-ins to see if third party software vendors were able to fill the gap. I was surprised to find that there is a relatively small offering of Microsoft Outlook plug-ins. I found three that I decided to assess. I’ve provided a brief summary of these tools below as well as my initial impressions. MissingLink – MissingLink was the first plug-in I looked at. It unifies emails, calendar entries, contracts, files, and tasks into a project view, which was one of the features I was initially looking for. I spent a day or two using the plug-in, only to realize that it was a quirky plug-in supported by a single developer. MissingLink simply wasn’t going to work for me and quickly fell to the wayside. ClearContext – ClearContext was the second plug-in I looked at. It had all the project-based features of MissingLink developed in much more professional format that integrated very well with both Outlook 2007 and Outlook 2010. MissingLink offers an abundance of features. As I evaluated these features, I found that ClearContext simply wasn’t for me. I don’t want to change my system for managing emails and ClearContext has a set way of doing things. Still, I’d recommend ClearContext to anyone looking for a new system to help manage their emails. The product looks to have a passionate user base who have benefited from using the product. Xobni is available as a free plug-in from xobni.com. Once you get hooked on the free plug-in, you can opt for Xobni Plus, which will set you back about $30. The plug-in offers a bunch of very cool features. I’ve provided some color commentary and screenshots of the things that have impressed me over the last several weeks. Try Xobni out. I think you’ll find yourself saying “Wow” too. Search. Xobni indexes all of your emails and provides screaming fast full text search. Once you use Xobni’s search, you will never go back to Outlook’s built-in search. Automatic Address Book. Even if you limit your Outlook contact list to a sane number of contacts, Xobni will go make an “automatic address book” that includes everyone you’ve ever communicated with. It automatically extracts phone numbers from the emails and adds them to the address book for you and, if you’re using Xobni Plus, Xobni will use your Automatic Address Book for email address autosuggest so you’ll never have to look up an email again. Social Network Interaction. Xobni crushes Outlook 2010 and Google’s Buzz, feeble attempts at integrating social media into email. Xobni seamlessly integrates with Facebook, Twitter, LinkedIn, and Salesforce, providing you pictures of the people in your address book along with Facebook and Twitter status updates. I have shocked to find how many pictures of people automatically made their way into my Xobni address book. Threaded Conversations with Zoom. You just have to see this one to believe it. Xobni creates threaded conversations for all of your interactions with a particular person. If you hover over the thread, you can see the entire conversation, along with the pictures of the people in the conversation (as available). Time Scheduling Feature. I just love this one and wonder why Microsoft didn’t think of this 10 years ago. Xobni generates an email with your availability for the next week and sends it to the person in question. Very convenient way to schedule meetings, especially across organizations that don’t share Exchange servers. 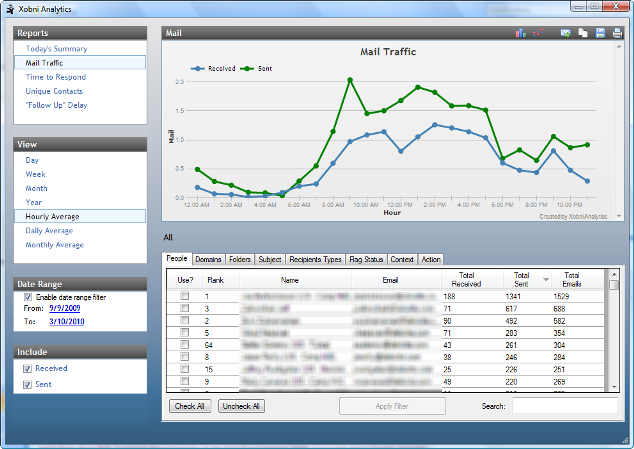 Email Analytics. This is less on the really useful side and more on the “cool and interesting” side. Xobni’s analytics range from person-by-person rankings of your most important contacts to detailed statistics and graphs that are generated outside of the plug-in in a separate analytics module. Xobni also offers up “fun facts” about who responds to you the fastest, who you respond to the fastest, etc. so that you can follow up to these contacts with emails (with links to the Xobni product, of course).